Arsenal have scored in each of their last 16 matches in Premier League. Manchester Utd have scored in each of their last 9 away matches in Premier League. 76% of Bournemouth’s matches had over 2.5 goals scored in Premier League. Chelsea have been undefeated in their last 9 home matches in Premier League. 67% of Leicester City’s conceded goals occured in the first half in Premier League. Huddersfield have lost their last 4 matches in Premier League. Southampton conceded at least 1 goal in each of their last 7 matches in Premier League. Manchester City have scored 2 goals or more in each of their last 9 home matches in Premier League. Fulham have failed to win in their last 9 away matches in Premier League. West Ham Utd have won their last 4 matches in Premier League. 73% of Arsenal’s goals have been scored in the second half in Premier League. 32% of Bournemouth’s conceded goals occurred after the 75th minute in Premier League. Arsenal have been undefeated in their last 8 home matches in Premier League. Burnley have lost 67% of their away matches in Premier League. Bournemouth conceded at least 1 goal in each of their last 7 matches in Premier League. 67% of Brighton & Hove’s points have been earned at home in Premier League. 65% of Arsenal’s conceded goals occured in the first half in Premier League. Bournemouth conceded at least 1 goal in 78% of their home matches in Premier League. Brighton & Hove have lost 67% of their away matches in Premier League. Chelsea have scored the opening goal in 76% of their matches in Premier League. Huddersfield have scored 70% of their goals away in Premier League. Southampton have lost 78% of their away matches in Premier League. Chelsea have scored 37% of their goals after the 75th minute in Premier League. Leicester City have scored in 89% of their away matches in Premier League. Huddersfield conceded at least 1 goal in 78% of their home matches in Premier League. Southampton have lost their last 4 away matches in Premier League. Manchester City have won 82% of their matches in Premier League. Chelsea were leading at halftime in 65% of their matches in Premier League. Huddersfield have failed to score in 67% of their home matches in Premier League. Manchester City have won 100% of their home matches in Premier League. Huddersfield have scored 40% of their goals in the first 15 minutes in Premier League. 67% of Southampton’s points have been earned at home in Premier League. Manchester City have scored in 100% of their home matches in Premier League. 61% of Huddersfield’s conceded goals occured in the first half in Premier League. Manchester City have scored the opening goal in 82% of their matches in Premier League. Manchester City were leading at halftime in 71% of their matches in Premier League. Huddersfield have lost 67% of their home matches in Premier League. Manchester City have won their last 9 home matches in Premier League. Crystal Palace have scored 64% of their goals away in Premier League. 68% of Newcastle Utd’s conceded goals were conceded at home in Premier League. Newcastle Utd have lost 78% of their home matches in Premier League. Manchester City have been undefeated in their last 9 home matches in Premier League. Crystal Palace have scored in 78% of their away matches in Premier League. Newcastle Utd have scored 36% of their goals in the first 15 minutes in Premier League. Fulham conceded at least 1 goal in each of their last 17 matches in Premier League. Newcastle Utd conceded at least 1 goal in 89% of their home matches in Premier League. 89% of Fulham’s points have been earned at home in Premier League. Fulham have scored 62% of their goals in the first half in Premier League. Crystal Palace have lost 67% of their away matches in Premier League. 62% of Newcastle Utd’s points have been earned away in Premier League. Fulham have conceded the opening goal in 76% of their matches in Premier League. Newcastle Utd have scored 71% of their goals in the first half in Premier League. Fulham were losing at halftime in 59% of their matches in Premier League. West Ham Utd have scored 2 goals or more in each of their last 4 matches in Premier League. Watford conceded at least 1 goal in each of their last 7 matches in Premier League. Cardiff City have scored 71% of their goals at home in Premier League. Fulham have lost 71% of their matches in Premier League. West Ham Utd conceded at least 1 goal in each of their last 6 home matches in Premier League. 71% of Cardiff City’s goals have been scored in the second half in Premier League. Cardiff City have conceded the opening goal in 76% of their matches in Premier League. Fulham have lost 89% of their away matches in Premier League. West Ham Utd have failed to score in 44% of their home matches in Premier League. Cardiff City have scored 41% of their goals after the 75th minute in Premier League. 82% of Manchester Utd’s matches had over 2.5 goals scored in Premier League. Fulham have lost their last 7 away matches in Premier League. West Ham Utd conceded at least 1 goal in 89% of their home matches in Premier League. Manchester Utd have scored in 100% of their away matches in Premier League. 36% of Watford’s conceded goals occurred after the 75th minute in Premier League. Cardiff City conceded at least 1 goal in 78% of their home matches in Premier League. Watford have conceded 2 goals or more in each of their last 5 matches in Premier League. 93% of Cardiff City’s points have been earned at home in Premier League. Lazio conceded at least 1 goal in each of their last 7 matches in Serie A. 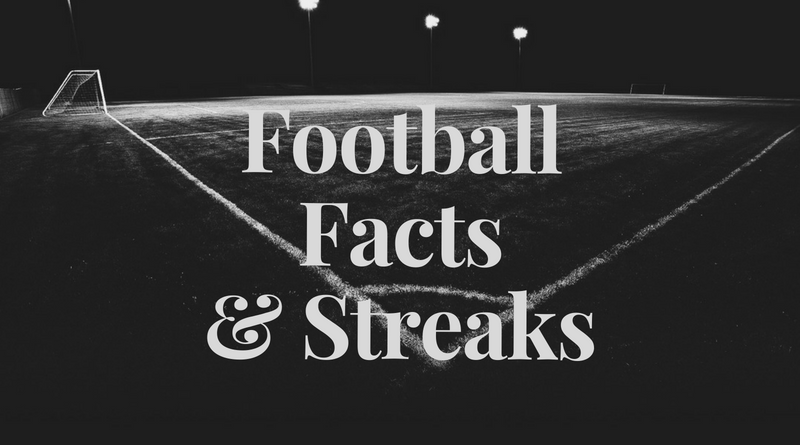 69% of Cagliari’s matches had under 2.5 goals in Serie A.
Empoli conceded at least 1 goal in each of their last 13 matches in Serie A.
Sampdoria have scored in each of their last 7 matches in Serie A.
Fiorentina have drawn their last 4 away matches in Serie A.
Genoa have scored in 100% of their home matches in Serie A.
Lazio conceded at least 1 goal in 75% of their home matches in Serie A.
Cagliari have failed to win in their last 6 matches in Serie A.
Empoli conceded at least 1 goal in 88% of their home matches in Serie A.
Sampdoria have scored 2 goals or more in each of their last 3 matches in Serie A.
AC Milan conceded at least 1 goal in 88% of their home matches in Serie A.
Fiorentina have scored 71% of their goals at home in Serie A.
Genoa conceded at least 1 goal in 75% of their home matches in Serie A. 75% of Genoa’s points have been earned at home in Serie A.
Genoa conceded at least 1 goal in each of their last 5 home matches in Serie A.
Atalanta have scored in each of their last 8 matches in Serie A.
Genoa have failed to win in their last 5 home matches in Serie A.
Atalanta conceded at least 1 goal in 100% of their away matches in Serie A. 61% of Genoa’s conceded goals occured in the first half in Serie A.
Atalanta have scored in 75% of their away matches in Serie A.
Genoa have scored 64% of their goals in the first half in Serie A. 41% of Fiorentina’s conceded goals occurred after the 75th minute in Serie A.
Genoa have failed to win in their last 10 matches in Serie A.
Fiorentina have been undefeated in their last 4 away matches in Serie A.
Genoa conceded at least 1 goal in each of their last 11 matches in Serie A.
Fiorentina have failed to win in their last 8 away matches in Serie A. 78% of AC Milan’s conceded goals occured in the second half in Serie A. 77% of Fiorentina’s points have been earned at home in Serie A.
Empoli conceded at least 1 goal in each of their last 7 home matches in Serie A.
Sampdoria have scored in 75% of their away matches in Serie A. 81% of Empoli’s points have been earned at home in Serie A.
Sampdoria have scored in each of their last 5 away matches in Serie A. 30% of Cagliari’s conceded goals occurred in the first 15 minutes in Serie A.
Empoli have scored in each of their last 8 matches in Serie A. Real Betis have scored 42% of their goals after the 75th minute in La Liga. FC Barcelona have scored 33% of their goals after the 75th minute in La Liga. Celta Vigo conceded at least 1 goal in 100% of their away matches in La Liga. Atletico Madrid have scored 33% of their goals after the 75th minute in La Liga. Espanyol have lost their last 5 matches in La Liga. 74% of Real Betis’s goals have been scored in the second half in La Liga. 75% of Eibar’s points have been earned at home in La Liga. FC Barcelona have scored 2 goals or more in each of their last 4 home matches in La Liga. Celta Vigo have scored in 100% of their away matches in La Liga. Atletico Madrid have scored in 100% of their home matches in La Liga. Espanyol have conceded 2 goals or more in each of their last 3 home matches in La Liga. Atletico Madrid have been undefeated in their last 6 away matches in La Liga. FC Barcelona have scored 2 goals or more in each of their last 3 matches in La Liga. Espanyol have scored in 75% of their away matches in La Liga. Atletico Madrid have been undefeated in their last 8 home matches in La Liga. 71% of Espanyol’s points have been earned at home in La Liga. 83% of Atletico Madrid’s conceded goals occured in the second half in La Liga. Espanyol have lost their last 3 home matches in La Liga. Atletico Madrid have scored in 75% of their away matches in La Liga. 63% of FC Barcelona’s conceded goals were conceded at home in La Liga. Espanyol have conceded 2 goals or more in each of their last 5 matches in La Liga. Atletico Madrid have been undefeated in their last 13 matches in La Liga. Celta Vigo have conceded 2 goals or more in each of their last 4 away matches in La Liga. FC Barcelona conceded at least 1 goal in 75% of their home matches in La Liga. Atletico Madrid have scored in each of their last 9 matches in La Liga. Celta Vigo have scored in each of their last 7 away matches in La Liga. 75% of Atletico Madrid’s matches had under 2.5 goals in La Liga. Eibar have scored 80% of their goals at home in La Liga. FC Barcelona have scored in each of their last 16 matches in La Liga. 47% of Lille’s conceded goals occurred after the 75th minute in Ligue 1. Rennes have scored 26% of their goals in the first 15 minutes in Ligue 1. 76% of Nice’s matches had under 2.5 goals in Ligue 1. Nimes have scored 2 goals or more in each of their last 3 matches in Ligue 1. Lille have drawn their last 3 home matches in Ligue 1. 61% of Nimes’s points have been earned away in Ligue 1. Nice did not concede any goal in their last 3 away matches in Ligue 1. Lille have been undefeated in their last 9 home matches in Ligue 1. Toulouse have scored 33% of their goals after the 75th minute in Ligue 1. Lyon have scored in 71% of their away matches in Ligue 1. Rennes have scored the opening goal in 82% of their matches in Ligue 1. Nice have scored 38% of their goals after the 75th minute in Ligue 1. Strasbourg have scored 36% of their goals after the 75th minute in Ligue 1. Nice have been undefeated in their last 7 matches in Ligue 1. Strasbourg conceded at least 1 goal in each of their last 5 home matches in Ligue 1. Nice have scored in 75% of their away matches in Ligue 1. Nimes have scored 38% of their goals after the 75th minute in Ligue 1. Strasbourg conceded at least 1 goal in 89% of their home matches in Ligue 1. 73% of Nice’s conceded goals were conceded at home in Ligue 1. Nimes have won their last 3 away matches in Ligue 1. Nice have been undefeated in their last 5 away matches in Ligue 1. Lyon have scored 2 goals or more in each of their last 3 away matches in Ligue 1. Rennes have scored 61% of their goals away in Ligue 1. 34% of Stuttgart’s conceded goals occurred after the 75th minute in Bundesliga. 69% of Düsseldorf’s matches had over 2.5 goals scored in Bundesliga. Stuttgart have lost 78% of their away matches in Bundesliga. 80% of Düsseldorf’s points have been earned at home in Bundesliga. Stuttgart have conceded the opening goal in 75% of their matches in Bundesliga. 72% of Düsseldorf’s goals have been scored in the second half in Bundesliga. 73% of Stuttgart’s goals have been scored in the second half in Bundesliga. 71% of Stuttgart’s points have been earned at home in Bundesliga. Düsseldorf have conceded 2 goals or more in each of their last 5 away matches in Bundesliga. Stuttgart have failed to score in 57% of their home matches in Bundesliga. Blackburn have scored in each of their last 11 matches in Championship. Norwich City have been undefeated in their last 10 matches in Championship. Reading have failed to win in their last 6 matches in Championship. 73% of Middlesbrough’s matches had under 2.5 goals in Championship. Stoke City have scored 2 goals or more in each of their last 5 matches in Championship. Millwall have failed to win in their last 7 matches in Championship. Blackburn conceded at least 1 goal in 73% of their home matches in Championship. 78% of Norwich City’s goals have been scored in the second half in Championship. Norwich City have been undefeated in their last 9 away matches in Championship. Millwall conceded at least 1 goal in each of their last 10 away matches in Championship. 39% of Millwall’s conceded goals occurred after the 75th minute in Championship. Reading have conceded 2 goals or more in each of their last 4 home matches in Championship. Middlesbrough have scored in 73% of their away matches in Championship. Millwall conceded at least 1 goal in each of their last 7 matches in Championship. Reading conceded at least 1 goal in each of their last 6 home matches in Championship. Millwall conceded at least 1 goal in 91% of their away matches in Championship. Reading have lost 55% of their home matches in Championship. 84% of Millwall’s points have been earned at home in Championship. Norwich City have scored 35% of their goals after the 75th minute in Championship. Reading conceded at least 1 goal in 91% of their home matches in Championship. Millwall have lost 73% of their away matches in Championship. Norwich City have scored 2 goals or more in each of their last 3 matches in Championship. Millwall have failed to win in their last 11 away matches in Championship. 39% of Blackburn’s conceded goals occurred after the 75th minute in Championship. Norwich City have scored in 91% of their away matches in Championship.